In the very near future, we will bid adieu to Google+ as it sails into the sunset never to return. As we approach our third year as a “Space for all things Chrome,” we owe a lot of our success to Google’s social sharing platform and as much as we will miss it, the time has come to move on to something new. We have kicked around a number of ideas for creating a place for users to migrate so that the Chrome OS community can continue to thrive. Reddit is a great platform for finding and discussing all sorts of ideas and such but there is already a great Chrome OS community there as well as a Pixelbook page and even one dedicated specifically to the Crostini project for Linux on Chrome OS. For that reason, Reddit just didn’t feel right. We aren’t trying to replace other groups or displace users. We simply want a cool place for techies like us to gather, communicate and even assist each other with hurdles that may arise in the daily use of Chrome OS. Many have suggested a forum hosted on the site itself. As useful as that could potentially be, as a couple of guys whose alter-egos are web designers by day, that’s a big can of worms to open that we just aren’t prepared to do. We don’t mind doing the work but on-site forums require a lot of policing that would take away from producing content which is what we’re all about. Aside from that, we love the way our site looks and a forum feels messy and unnecessary when there are other, really good options already available. That doesn’t mean we will never consider it, just that it’s not on the current topography of the website. So, where did that leave us? Facebook? Not a snowball’s chance in Hades. No offense, we avoid the old FB like the plague. Too many adds, algorithms and plain ole’ trash but what if there were a site like Facebook that didn’t have all the junk that makes FB agitating? Launched in 2016, MeWe is the site that Facebook could have been. Of course, Zuck might not be sitting as pretty as he is today but, that’s cool. We aren’t mad at him. With the motto #NotForSale, MeWe touts an ad-free, tracking-free and bot-free user experience on a robust social networking platform that offers pages, groups, chat and more. They even have Android and iOS apps to stay in touch on the go. 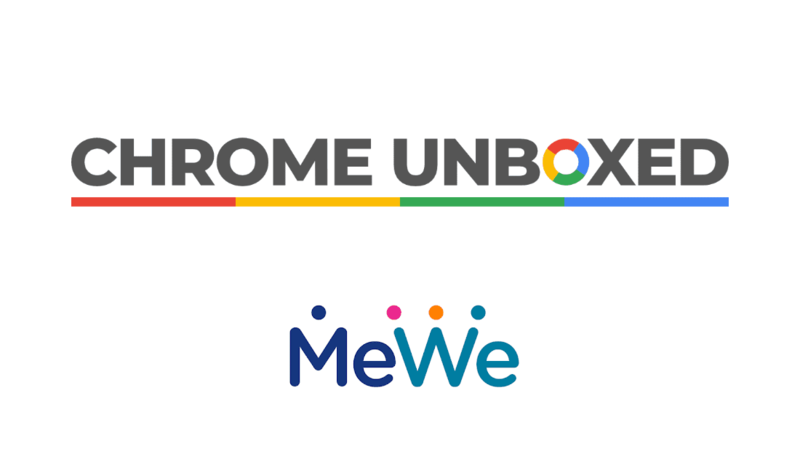 Free forever, you can join MeWe with your email or phone number and we would like to formally invite you to join the Chrome Unboxed group as we expand into this emerging social network. We will follow up with an official Chrome Unboxed Brand Page later this week but were are more focused on having a place where we can all chat, share and just be a community. We do our best to field emails and comments on the site but being a part of a social network community is more conducive of an interactive environment and we’d love for you to join us. We look forward to seeing you there and with any luck, we will have found our new Google+. With that being said, let’s see how quickly we can get to 1000 members. Share with your friends, co-workers and yes, on Google+. Let’s get this party started at MeWe.